Kickass McAwesome: That Card's Still Going to Explode, Right? That Card's Still Going to Explode, Right? Oh man, this is probably one of the nerdiest obscure jokes I've made for this comic, and I love it. Hopefully some of you do as well. For a little backstory for those of you not as nerdy as I, Remy Lebeau, a.k.a. Gambit grew up in the New Orleans Thieves Guild, who are in constant conflict with the Assassins Guild. 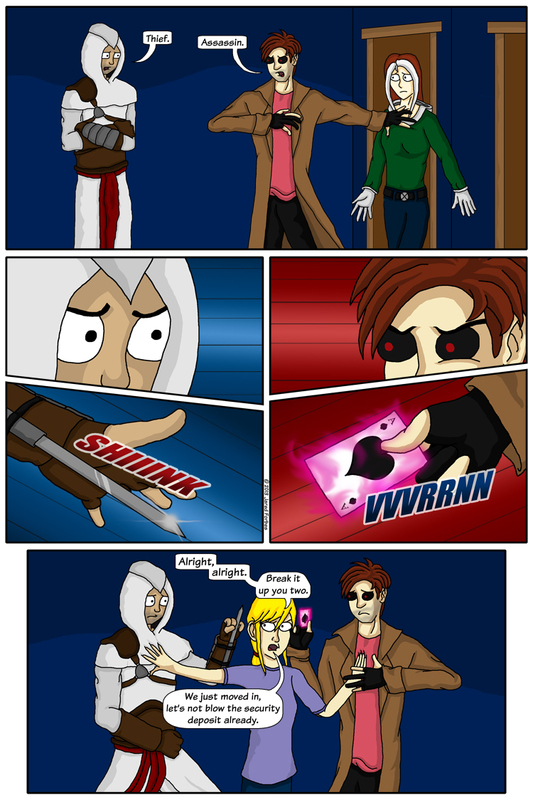 So, Remy's a thief, Altaïr's an assassin. I smell shenanigans! Or at least I would, if Elayne didn't break up the fight.